He’s an immensely popular New England athlete who has excelled at his sport for the better part of a decade and a half, capturing multiple championships, often in atrocious weather. He has remained at the top of his game well into his late 30s, capable of winning on any weekend. His boyish good looks have launched numerous ad campaigns and magazine photo shoots. And his beautiful wife from a foreign country is more than capable of turning heads on her own. Tom Brady, right? Nope. It’s Tim Johnson, the pride of Massachusetts and the country’s most accomplished cyclocross racer. Granted, Brady is one of the NFL’s brightest lights, while Johnson has toiled in relative anonymity in the niche-but-emerging discipline of cyclocross. But the similarities between the New England Patriots quarterback and Johnson are uncanny. 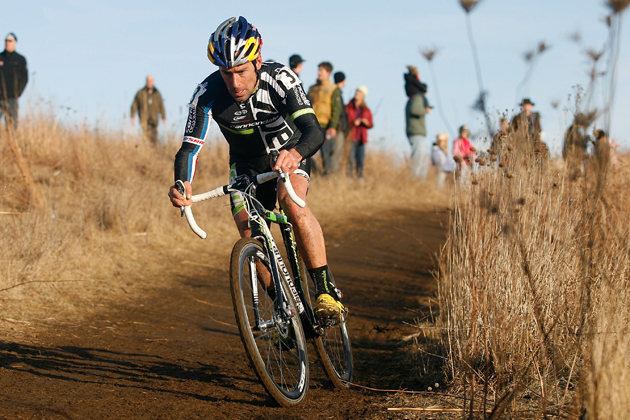 The 37-year-old Johnson has been the face the U.S. cyclocross for the past 15 years. In 1999, he burst onto the international scene as the first American to podium in the UCI World Cyclocross Championships, pedaling to a bronze medal in the junior category in Slovakia. Today, Johnson is a six-time national champion, with three elite titles, two Under-23 championships and a junior crown on his résumé. Last year, Johnson ranked second in the U.S.—and made the top 20 in the world rankings—and took third at the National Cyclocross Championships in Colorado in January. In February, he competed in the world championships as a member of Team USA for the 14th time. Before this season, Johnson was optimistic that he could improve on those results. ​“I feel like I still know how to drive it,” he said. Johnson’s unparalleled run, however, could end this weekend, at the U.S. National Cyclocross Championships in Austin, Texas. While Brady plays in yet another postseason with the Patriots, Johnson acknowledged he won’t make Sunday’s starting line, two decades after his first Nationals. That’s because of similarities with another Boston icon—Larry Bird. Like Bird, Johnson is battling the cumulative wear-and-tear of a brutally tough sport, and his lower back has absorbed the brunt of that punishment. 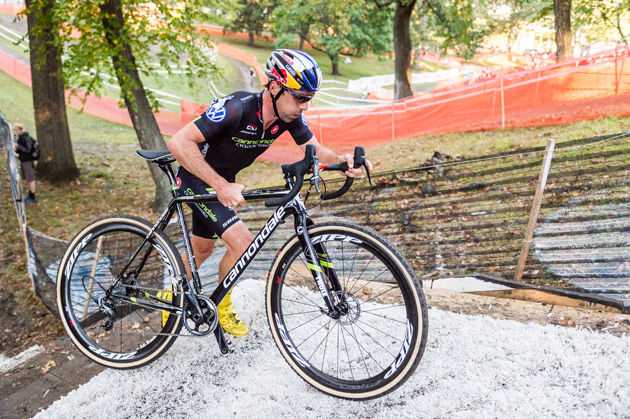 Weighing only 155 pounds, with less than 10 percent body fat, Johnson has fallen prey to the rigors of cyclocross’s signature move—a dismount, quick sprint over obstacles or uphill, and remount. That repetitive pounding led to bulging discs in Johnson’s back, which impinge on key spinal nerves. A typical cyclocross weekend consists of Saturday and Sunday races. With his back injuries compounded by ceaseless travel, Johnson needed the better part of the week to recover. Then, during Saturday’s race, he would “ruin it again,” leaving him little chance of being successful on Sunday. ​“With that [pattern], I couldn't stay above water,” he says. “I’d just have this really deteriorating performance, where my power would go down. I’d look at my power meter and see that I wasn’t putting anything out. My heart rate, instead of averaging 185, I’d be averaging 155. And I’d be in pain. Fortunately for Johnson, his wife, Lyne Bessette, a former professional road racer, two-time Canadian Olympian (2000 and ’04) and Paralympic gold medalist (’12), helped him maintain perspective during an increasingly difficult season. But she couldn't heal his back. ​Johnson was ranked fifth in the country in late November, with several top-three finishes, but his back woes led to a cruel downward spiral. By Christmas, he ranked 14th among USA Cycling's elite. After a Jan. 4 race in Dallas, Johnson said his body simply wasn’t capable of producing the power needed to be a contender. “This isn't a retirement,” he said while driving to Austin this week. “It just means I won’t be racing nationals. Still, Johnson will attend the nationals (the first time the event has returned to Austin in 37 years) if only to enjoy the massive growth of cyclocross that the five-day event represents. Nationals will feature hundreds of racers, and thousands of spectators, at Zilker Park. ​The premature end to his season notwithstanding, Johnson says he’ll continue working with his sponsors—Volkswagen, Red Bull, Cannondale, Oakley, and Strava—and with advocacy groups such as PeopleForBikes. But cyclocross fans will always remember the fresh-faced kid from Massachusetts who became the country's first real star in cycling’s wildest discipline. If this season does mark the end of Johnson’s pro career, he will have few regrets. Despite the Tour de France and world championship victories of Greg Lemond and Lance Armstrong (whose seven Tour victories having since been rescinded), Johnson can lay claim to being one of the most versatile competitive cyclists ever produced by the United States.